With SurveyLion, you will earn an incentive for every online survey completed. Incentives are typically cash payments and once you have a balance in your account, you can request a payment which will be mailed to you in the form of a cheque. Some surveys will offer a gift certificate or a product instead of cash as an incentive – the survey invitation e-mail you receive will state this as well as the estimated amount of time it will take you to complete the survey. You can choose whether to request a payment after every survey you complete, or you can accumulate a larger balance and request your payment then. There is no minimum balance needed in order to request a payment cheque – as long as you have completed at least one survey, you can request a payment right away or wait until you have accumulated more in your account if you prefer. All payments are made by cheque and will arrive at your home in 3 to 5 weeks after your request. Simply log into your account and click the “Request Payment” button in order to receive your cheque. Get $5 for every friend you refer! For every friend or family member who lives outside of your household who becomes an active member of SurveyLion using your link, you will be credited $5 to your account. An active member is defined as someone who has successfully completed one (1) paid survey OR has attempted to complete three (3) paid surveys but was screened out (either overquota or did not meet survey qualifications). You can refer others to the program by simply sending an e-mail to them through your SurveyLion account. The amount of cash offered per completed survey ranges from $1 and $10, depending on the length and complexity of the study. Occasionally, multi-part studies may become available which will provide more significant rewards than regular online surveys. The majority of SurveyLion surveys take between 5-15 minutes to complete. SurveyLion is a Canadian online survey panel operated by Canadian Viewpoint, and has over 300,000 members. Canadian Viewpoint was founded in 1980 and conducts surveys not only online but also via telephone, in person, or in-store. Canadian Viewpoint adheres strictly to the marketing research standards set out by the Professional Market Research Society of Canada (PMRS) and CAMRO (Canadian Association of Market Research Organizations). It’s easy to become a member of SurveyLion. Simply complete the short member registration form, check your e-mail for a confirmation message and click on the link confirming your registration. From that point on, check your e-mail account for rewarding survey invitations. The survey invitation will state the topic of the online survey, the approximate length of time it will take you to complete it, as well as what your reward will be for completion. It is always your choice whether or not you are interested in completing the survey – it is never mandatory or a requirement for anything. When will I be confirmed a member at Survey Lion??? 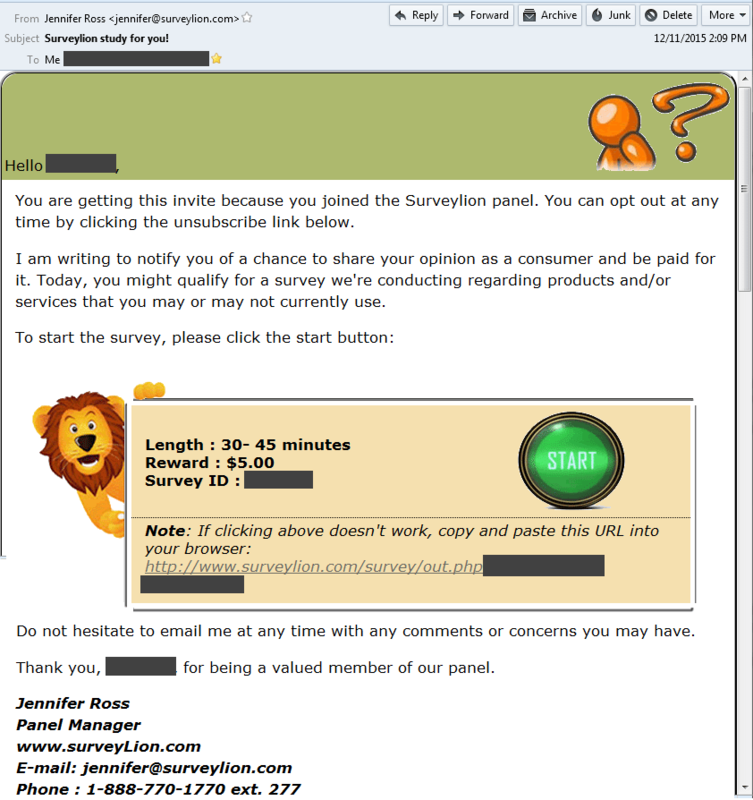 After you become a member of SurveyLion, check your email inbox for an e-mail from them asking you to confirm your membership. The e-mail should have a url you need to click on in order to verify your membership. If you do not receive this e-mail, first check your junk mail folder to see if it is there. If not, please contact SurveyLion directly and ask for technical assistance. You can do this at: info@surveylion.com or 888-770-1770.